Yasushi Fujiwara was born in Kyoto in 1963. 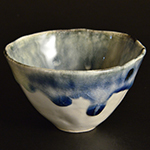 (His father Shin Fujiwara is also one of the foremost ceramic artists.) 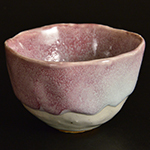 he completed his study at Kyoto-furitsu Toko Shokugyo Kunren-ko (Kyoto Prefectural Vocational Training School of Ceramic Art) in 1988. He won the Mayor prize at the Kyo-ten (Kyoto Exhibition) in 1990. He won the prize for encouragement at the Togei Biennale exhibition in 1991.